Card matched on Experian. Rebuilding credit. Applied. Approved. I received the no annual fee rewards card. I thought $300 was pretty low for my score, as opposed to some others. I was referred by Credit Karma and just applied-got approved for a $2500 limit, not bad. No annual fee with this card. I was not looking for anything special. Something to use on a trip for just for emergency's. This is for folks who don't have the greatest credit scores, but considering the $39 annual fee, and the high percentage rate, that is to be expected. Good thing is this is NOT one of those horrific companies that charge hundreds in fees just to apply, so from a consumer standpoint, for those with not the greatest credit scores, this not a bad basic credit card. I have been rebuilding my credit for the last year and a half. My scores are in the mid 600s and I already have a Sears, Fingerhut and a Credit One. 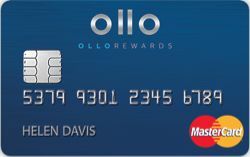 I got a mail with an invitation for the ollo and my first impression was that it has a low annual fee and rewards program (I am paying $75 on my credit one and it does have cash back as well @1%). I applied and was approved for $1000. I got the invite for 2 ollo cards. I have not pulled the trigger yet. My score is like around 574. One of the cards has no annual fee. The highlights (at least to me) seems to be that they do away with a lot of fees like foreign transaction fees, late fees and over-the-limit fees. The second offer is this card I think. $39 annual fee but 2% cash back on gas, supermarkets and drugstores. This seems like the better deal. But I am waiting for more feedback before I pull the trigger. Most of my other rebuilder cards come with high fees. For example, my Credit One has a $75. But before that, I had continental finance and I had to pay an annual fee and monthly which came up to about $200 a year in fees. I have since canceled that. I do not mind paying $39 for the card and get cash back rewards. My Credit One also gives me cash back so that's two cards with rewards for me. I am nearly there at 700 and decided to get this when I got the mailer. Looks pretty and I got a decent credit line too. My score is in the 675 area. Others have tried to compare this card with the Blue Cash Everyday but I think it is an absolutely wrong comparison. The BCE is for those with great credit whereas this card (looking at the interest rate and my score) is clearly for rebuilders. The small annual fee is worth it for the rewards. I got the mai but decided against it. My score is a 653 from EX and I assume I should get approved. But I was not willing to pay the annual fee. I have the old barclaycard rewards mastercard which is pretty much the same card. I also have a sears and macys card (both no annual fee) and a cap one quicksilver rewards (the version with the annual fee). So right now, I am quite hesitant to get another card with an annual fee. I also got the invite for a Ollo platinum which has no annual fee. Might consider that one. I got the mail offer and here are the terms. rewards; 2% on gas, supermarkets and drugstore - good. while it looks ok, I don't understand why wouldn't you simply get the amex blue cash everyday with no annual fee and the same rewards? I am quite torn between this card and the cap one quicksilverone. I ended up applying for both at the same time and was approved for both! Prior to this, I started my rebuilding process 2 years ago with 2 secured cards. I then graduated to FP and Credit One. I am now looking for a real credit card without ridiculous fees. Since I have already had the First Premier (about to be canceled) and Credit One, I figured that Ollo wouldn't be so bdad. I applied and got approved for $300, which is really small. This sure looks like it is going after capital one. I got the offer in the mail. EQ score was 694. I applied and got $1000 in limits. I'll check in at a later date and report on my experiences after a few months of using the card. Got the invite, applied and was approved. I also have the quicksilverone. I will use these 2 cards for cash back. I think they are both a great combo. I was actually surprised to get the mail offer and the terms and more surprised that I actually got approved. The limit was small ($300). But not many cards offered to me earns rewards and has a very reasonable annual fee. I already have a couple of store cards like macy's and sears and also a capital one card. Will probably go on gardening for a while.